Please contact us for discounts on orders for 10 or more books. 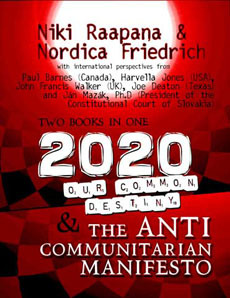 After seven years printing them seperately, 2020: Our Common Destiny and The Anti Communitarian Manifesto are now available as a combined e-book and as a hardcopy mass-market paperback edition. A HUGE thanks to everyone who pre-ordered our book. We apologize for the delay. We will be shipping out the paperback hard-copy version to the people who pre-ordered it on March 23, 2012. If you purchase an ebook, you should receive an email from me. If you have not received your book, there may have been an error. Please email nfriedrich@gmail.com right away so that we can send you the password you need to download your purchase. If you have any other questions, please call (907) 887-9095 or email nfriedrich@gmail.com -- thank you!